What are the Top Exercises for People Over 50? Losing mobility is one of the major problems aging adults face, so its a good idea to understand the best walkers for seniors. As we age, our bones, muscles, and joints age too resulting in posture and gait changes that lead to weakness and gradual loss of mobility. Medical problems such as heart disease, arthritis, and Alzheimer’s, which are common in seniors, also cause loss of mobility. When you have trouble walking you lose your independence. You have to depend on others for things as basic as getting to the bathroom or grabbing something to eat. This scenario is frustrating and can lead to isolation and depression. But do not lose hope just yet. With mobility aids such as walkers, you do not have to depend on anyone to move around.A walker offers more stability than a crutch or a cane. The main challenge is determining which walker will best suit you or your loved one. Fortunately, you are in the right place. In this article, you will learn about the various types of walkers and how to choose a walker that will best suit your needs. Also, towards the end, you will find reviews of some of the best walkers in the market. The first step of buying a walker is understanding the various types of walkers. The standard walker is the most popular. It has four non-wheeled legs with handlebars at the top. The user has to lift the walker and drop it a several inches ahead then take a few steps towards the walker. These walkers are cheap, lightweight, and durable. The movement with this type of walker is slow. It is best suited for smooth surfaces. This walker is highly recommended for seniors with wobbly balance – those who cannot stand well on their own. This type of walker resembles the standard walker but has wheels on the front legs. The wheels allow the user to push the walker instead of lifting the walker. The wheels make the walker ideal for uneven terrain. This walker is recommended for use indoors and outdoors. However, moving can be a challenge on thick carpets. This type of walker is for those people with moderate to good balance. Remember, if you put too much weight, the wheels will move rapidly making you lose balance. Rollators are walkers with wheels on all legs. The handlebars have brakes that are activated by squeezing. The wheels make this type of walker to offer the best mobility. Most come with seats that allow you to rest when you get tired. For further independence, these walkers come with baskets. This type of walker is best suited for a senior who does not need to lean on the walker for balance. Rollators are best suited for outdoors. Their major drawback is that they are heavy. Most weigh around 20lbs. The 3-wheeled rollator is a variation of the 4-wheeled rollator discussed above. They have a triangular shape, with one wheel at the front and two wheels at the back. Like the 4-wheel version, this rollator has brakes on the handlebars to stop movement. This type of rollator is smaller than the 4-wheeled rollator, and the triangular shape allows for better maneuverability. However, this type of rollator does not have a seat. Fortunately, most have a storage basket. Where will you use the walker? Will you use the walker indoors, outdoors, on smooth terrain or on uneven ground? Wheeled walkers, such as rollators are the best for outdoors and rough terrain. The standard and front-wheeled walker are suitable for indoors. What is the size of the user? Most walkers will fit most seniors. However, the average size of a walker might inconvenience very tall and very short people. Walkers have weight limits. Therefore, large seniors should consider walkers with a huge weight limit. If the walker will be used indoors consider the width of the hallways and doorways. The 3-wheeled rollator and the front wheeled walker are the best for use in narrow spaces. Still, there are 4-wheeled rollators that are narrow and small-sized enough for indoor use. How long will you use the walker? In some cases, loss of mobility is caused by injury or a temporary disease, where full recovery is expected. For temporary use, the best walkers are the standard walker and the front-wheeled walker. We recommend this because these walkers are cheap and readily available. Walkers take up space. So, consider the size of the walker if you have limited space in your car and house. If you travel a lot, go for the folding models. They are easy to store in the house, car trunk and even the backseat of your car. The following are reviews of the best walkers in the market. 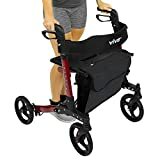 SUPERIOR SUPPORT AND STABILITY: Lightweight and durable, the Vive rollator provides stable support, easily maneuvering over any type of surface with large 8" sport wheels. The handle height is adjustable for a customized fit for every individual. Supporting up to 300 pounds, the lightweight aluminum frame is corrosion-resistant and folds down for easy storage and transport. Includes a wide seat and backrest for comfortably resting while on the go. COMPACT FOLDABLE DESIGN: The collapsible rollator is compact when folded, easily fitting in the trunk of a car or even in the backseat. Hassle-free folding in one easy step. Simply pull up on the center strap under the seat. For more compact storage, the front wheels are removable with a simple push button release and the back wheels are hinged to fold up against the frame. DUAL BRAKING SYSTEM: Each of the ergonomic handles is angled to position hands in a neutral position, reducing fatigue and allowing easy access to the bicycle-style hand brakes. Wheel locking brakes ensure the rollator will not move when activated. CONVENIENT SAFE STORAGE OPTIONS: Conveniently and safely store daily necessities in the detachable rollator bag. Safely holds a purse or wallet, medications, electronic devices and more. Also includes an integrated cane holder. The Vive Folding Walker is a lightweight standard walker that is foldable. It has an adjustable height to accommodate people with heights between 5’-1” and 6’-6”. Unlike most standard walkers, it comes with a bag and the option to use it with two front wheels. The wheels are an additional feature that can be removed and attached when needed. The walker can be used both indoors and outdoors. • Lightweight – weighs only 6 pounds. • A detachable bag which can be used as storage for personal items. • Foldable – has two buttons that allow easy folding. • 250 lbs – weight capacity. This front-wheeled walker caught our attention because it is narrow enough for use indoors. Also, it is light and folds easily; to fold it, you push two buttons. It has glide tips on the back legs, which allow the user to push the walker instead of lifting. It has 10” height adjustment and can accommodate seniors between 4’-10” and 6’-2”. • 21.75” width – can fit in most doorways. 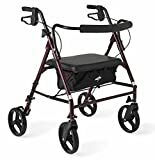 • Glide caps on the rear wheels – the walker can be glided on smooth surfaces instead of lifting. • Lightweight – weighs only 7 lbs. The Drive Medical Winnie Lite is a small, lightweight, and beautiful 3-wheeled rollator. It has 7.5” wheels that allow smooth gliding even on uneven terrain. Its small size (22.75” × 26” × 32”) makes it convenient for use indoors. The most distinct feature is the fabric storage pouch. The handlebars can be adjusted to suit the height of the user. The height limits are 4’10” and6’2”. • Convenient for both outdoor and indoor use. This heavy-duty rollator walker by Medline is designed for large seniors. It has a 500 lbs weight capacity, it is wide (29”) and has a wide seat (23.5”). It has a storage basket under the seat. The handlebars’ height is adjustable to fit both short and tall seniors. It has large wheels, 8”, which are very convenient for movement on uneven terrain. This walker is suitable for outdoors and is too wide for indoor usage. A walker helps with the mobility of a senior, making them more independent. There are factors you should consider to make a good purchase. And, you need to understand the different types of walkers and how they are used. All this information has been shared above. Click here, for more info on the best mobility scooters available or here for information on the the best wheelchairs.